People like to talk about money being the root of all evil. The actual quote is slightly different. The actual Biblical quote indicates that it is not money that is the root of all evil; it is the love of money that is the root of so much of the evil we see in the world. Golf has changed dramatically in the past thirty or so years. The equipment has changed. The courses have changed. And much of it has been the direct result of the love of money. Equipment manufacturers want to sell equipment. That's why the equipment has to keep changing. Golf course builders don't just want golf courses; they want to sell real estate. The result is virtually unwalkable designs that warrant the use of motorized golf carts to get the golfers around the course and increase the profitability for the owners at the same time. Follow the money if you want to understand why golf is so different from what it was in 1970, and why it may be in trouble. Gary Player bemoaned the fact that modern players, with modern equipment, have so beat up on the Old Course that it is becoming obsolete as a major venue. I don't necessarily agree with him. But, if it's true, it's all down to that love of money that seems to govern the game these days. A philosopher once said we should not ask why things were so much better in the old days. He felt that it was not an intelligent question. But I, for one, miss the days of persimmon woods and balata balls. I miss walking the golf course. I don't like motorized carts, and yet I'm so crippled I actually have to use one. I couldn't walk eighteen holes right now, and may never be able to again. I miss the old days. For me, they were better. But very little remains the same. Things change. But not the love of money; that's the thing that is still the root cause of so much of the trouble we see today. Want to know why things are the way they are in golf today? Look no farther than the money--the love of money. That's your problem. And how do you fix it? That's the 64 million dollar question. 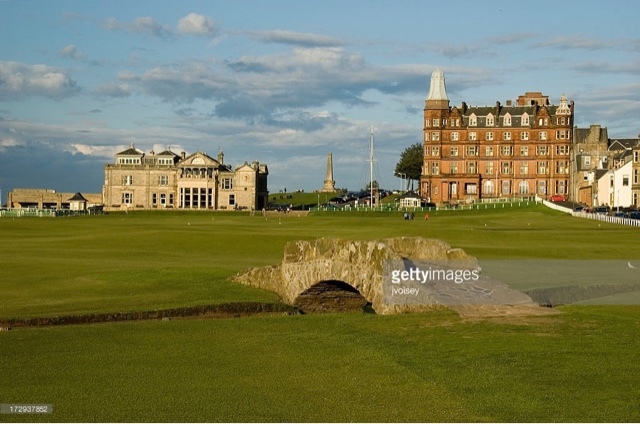 As for the Old Course; that jewel of St Andrews and the golf world; that grand old lady will be just fine. She might get beaten up when the wind lays down. But just add some wind and rain and she'll hold her own.